Investing in cryptocurrencies is one of the more high-risk ways that you can deploy your money. But it can be rewarding. Bitcoin, which has single-handedly brought digital currencies into the public domain, earned huge returns for those who had the foresight to get into the market early. Just about eight months and a half months ago, on 1 January 2017, bitcoin was trading at US$997 a coin. By the beginning of September, its price had climbed to US$4,950. Similarly, Ethereum, the other major virtual currency, has earned its investors high returns as well. In early March this year, an ether token was valued at about US$15. On the 2nd of September it was trading at US$391. But trading cryptocurrencies is not for everyone. The roller-coaster valuations can test the resolve of even those investors who are willing to take on greater risks. Consider ether prices in the last 12 months. 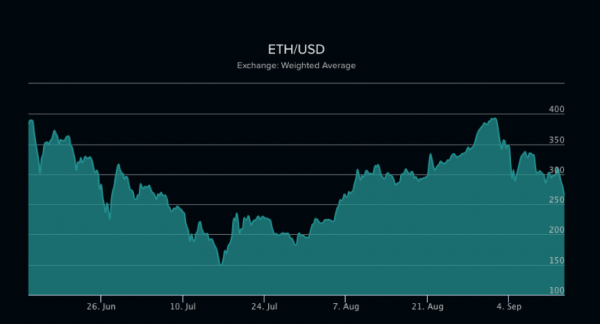 In this period, ether values have ranged from just over US$6 to US$416. There are potential gains to be made in trading cryptocurrencies, with the wild volatility. If you want to start trading ether or bitcoin, there are various methods to gain exposure. Your cryptocurrency wallet does not actually store your bitcoin or ether tokens. What it does is to keep a record of a private key, which is a secure digital code that gives you ownership of a public key. This public key, in turn, is connected to a certain amount of digital currency. In effect, your digital wallet contains the code that allows you to access your ether or bitcoin. The most important role that it plays is to keep your private “code” or “key” safe. A digital wallet can be on your desktop or on your smartphone. You could even opt for an online wallet. While you don’t really need to have knowledge about writing computer programs to own a cryptocurrency or to trade in it, some familiarity with technology is useful. Of course, you would need to have a digital wallet as well. What if you don’t want to maintain a digital wallet and actually own bitcoin or ether, but you do want to trade in these virtual currencies? Fortunately, there is a way to do this. A contract for difference (CFD) is an agreement with a broker that allows you to make a profit (or a loss) when the price of the underlying asset changes. It is important to remember that at no point in time do you actually own the underlying asset, which in this case is the cryptocurrency. There are several advantages to using CFDs. Firstly, you are not exposed to the Bitcoin or Ethereum platform. Although these are very secure, there is always the possibility that they may get hacked. Some time ago, one of the largest bitcoin exchanges in the world had a break-in. Bithumb, a South Korean cryptocurrency exchange suffered a data leak in which 30,000 of its users were affected. The exchange has said that it will pay each affected client 100,000 Korean Won in compensation. That’s about US$88 for every user. Bithumb didn’t put a figure to the losses that it had suffered. According to a news report, one customer said that he had incurred a loss of 10 million Won in the theft. The exchange has promised additional reimbursement to those who lost more than 100,000 Won. If you trade using CFDs, you will not expose yourself to this type of risk. The general price trend for cryptocurrencies over the long-term has been in one direction. Prices have been moving constantly upwards. So a person who bought an ether token for US$1 at the beginning of 2016 would have seen a 275-fold appreciation. Bitcoin, which traded at US$13 in January 2013, is now worth over US$4,000. But although the general trend is upwards, there are times when certain news triggers a sharp fall. Why do digital currency prices show such wild swings? The uncertainty regarding the validity of these currencies plays a major role in influencing prices. 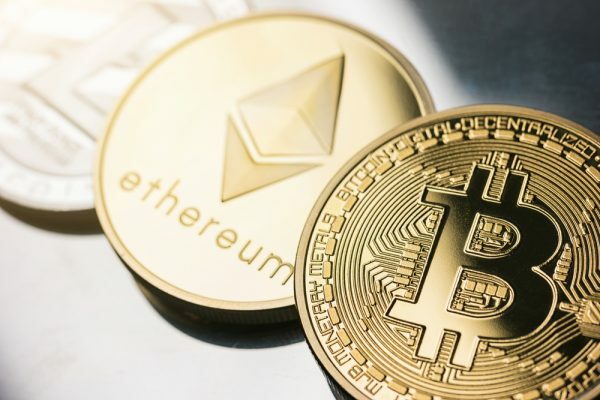 Recently UK’s Financial Conduct Authority said that investing in an initial coin offering (ICO) which raises money for a new cryptocurrency venture could result in investors losing all their money. The market reacted by driving down prices. Similarly, news that Chinese authorities plan to shut down some bitcoin exchanges has resulted in selling pressure. 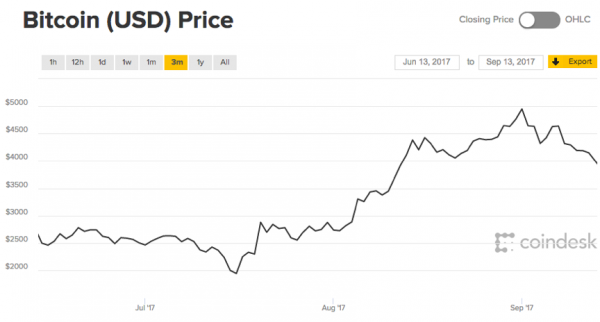 Bitcoin prices have lost about US$600 in the week 6 – 13 September. Is there any way that investors can cash in on these price swings? CFDs allow you to go short on digital currencies. If you think that prices of bitcoin are set to fall, you can place a trade that will result in a profit if your prediction is correct. Digital currencies are very volatile as the total currency volume available in the market is fairly limited. According to ethereumprice.org, the total market cap of ether is US$25 billion. Bitcoin availability is greater. A recent report on CNBC puts the market cap of bitcoin at US$73 billion. These volumes are dwarfed by the amounts available in the forex market. Due to this reason, digital currency values fluctuate much more than fiat currency prices. Central banks play an important role in managing their respective exchange rates. In the case of digital currencies, there is no central bank involvement. Hence price swings are completely market-driven and tend to show sharp increases and decreases. CFDs are traded on margin. By putting up a relatively small amount, you can earn a large return or, if the trade goes against you, make a steep loss. When trading digital currencies, you should realise that you are exposing yourself to great uncertainty and risk. Remember not to over leverage, or make this risky asset class a disproportionally large percentage of your portfolio. If you are willing to accept these conditions, then digital currency trading can be a good option. By making the correct trades, you can book profits of a magnitude that are not available in most other investments. For tomorrow’s investors, find out why everyone is talking about cryptocurrencies in this free ebook written in partnership with Bloomberg. Download your free book now. This article was sponsored by IG, the world’s No.1 CFD provider (by revenue excluding FX, 2016). All views, opinions and recommendations expressed in the article are the independent opinion of ZUU and do not in any way reflect the views, opinions, endorsements or recommendations, of IG Asia Pte Ltd (Co. Reg. No. 20051002K) (“IG”). Information is for educational purposes only and does not constitute any form of investment advice nor an offer or solicitation to invest in any financial instrument. No responsibility is accepted by IG for any loss or damage arising in any way (including due to negligence) from anyone acting or refraining from acting as a result of this information or material.